CINCINNATI -- We've been waiting since December for two things in the Tri-State: spring and to learn the fate of FC Cincinnati's bid for a spot in Major League Soccer. One of those has arrived reluctantly. To tide us by as FC Cincy-watch continues, have a look below at a conceptual site diagram released Tuesday showing how a 28,080-seat stadium would fit into the West End, plopped down atop Central Avenue and bounded by Central Parkway and Wade, John and West 15th streets. "This diagram is part of a fit study to demonstrate how the stadium could orient on the West End site," wrote FC Cincinnati spokeswoman Anne Sessler in an email to WCPO. "There are other possible orientations, configurations, seating capacities and other design specifications that will be evaluated in a full design process, beginning with the formal hiring of architects, which would commence if an MLS team is awarded." The West End appears to have gained favor once more among city leaders over sites in Oakley and Newport, Kentucky, after the OTR-adjacent neighborhood was seemingly doomed mid-March . West End Community Council President Keith Blake has been working with FC Cincinnati leaders for months to balance residents' interests with the growth and opportunity the soccer club could bring. RELATED: FC Cincinnati stadium could transform the West End, but is it for the better? Blake has told WCPO that a laundromat and a health food store, new jobs, as well as modestly priced rentals or homes top the wish list for his neighborhood. Many residents have to commute to other neighborhoods for work, he added. New jobs could change that. 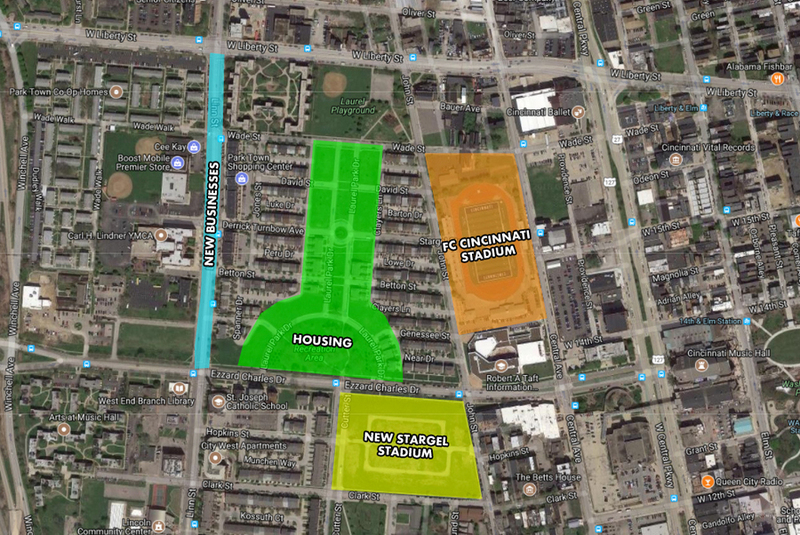 This map shows one potential neighborhood configuration for an FC Cincinnati stadium to replace Stargel Stadium in the West End.